Black Ice Software - BiBatchConverter version 4.32 is released! BiBatchConverter version 4.32 is released! If you no longer wish to receive our newsletters please click here. 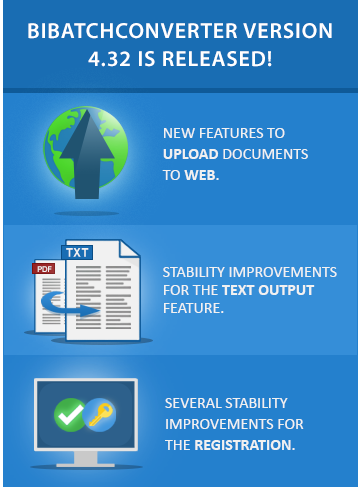 New Upload to Web feature, Stability improvements for Text Output, Registration and more! Black Ice Software has released the BiBatchConverter version 4.32. The latest version added new capabilities to upload documents to web servers using HTTP and HTTPS protocol. By using the new Upload to Web feature, users can send the converted documents to a specified web address with POST requests, which is the most common solution to upload documents to a website. The latest BiBatchConverter comes with a stability improvement for the Text Output feature, where the Printer Driver was inserting an extra space character into the text output. The latest BiBatchConverter also includes several stability improvements for the registration of the software along with updated documentation to enhance the user's experience. Do not forget to subscribe to future releases by purchasing maintenance. With an active maintenance subscription, you will receive all new releases for free! Priority email technical support is also included in your subscription. For more information call us at +1 (561) 757-4107 Extension 2, or email us at sales@blackice.com. Download the latest BiBatchConverter Now!